Yesterday, I posted a nostalgic look at some of the toys/momentos that reside in my office. Today, I’m wondering whether I’m alone in collecting such items. 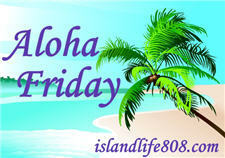 My Aloha Friday question for today is: Does your office contain toys/momentos from past trips or other memorable events? If you don’t have an office, do you have a special place where you place these kinds of things? I have a small bell with lighthouses on it and a shell from a beach trip, but that’s all. Oh wait, I have a shot glass with lighthouses on it too. My closet, the kids are not leaving us with much room even though we have a fairly large house. Hmmm, my office is also our tv/game/craft room & my desk is presently covered w/ a sewing machine & school books. As for mementos of past vacations? I have pix on the wall & some other things in a box. We have them in a box awaiting a home. Seems like I keep getting ‘evicted’ and my office winds up relocating…. Right now, my computer is set up in my dining room which has the usual dining room cabinet with various chachka’s in it. I have little places through out home with things from trips . My desk has photos of family gone and of the old days. I love seeing them when I am working there. Sorry playing a little catch up with the blogs I follow. As a Navy guy I have quite the arrangement of awards, plaques, certificates, pictures, Chief Petty Officer gear, and Navy propaganda from my years so far in the Navy. A great deal of this was in my home office before it became a play room (I don’t mind… too much). My favorite memorabilia ends up my office at work which most recently was my scale model submarine and plank owner certificate.